KnownHost is one of Scott's favorite VPS companies. If you are considering purchasing a KnownHost standard VPS or a hybrid VPS, be sure to look at his full review below! On this page, you will find his full in-depth review of their service from packages and pricing to what the service looks like once you are a paying customer. The goal of this page is to inform you of everything from the pros to the cons of using KnownHost as your VPS provider. If you are left with any questions, contact Scott so he can make an update! SPECIAL OFFER - Earn up to $30 to fully and honestly review KnownHost. Click here to start the review process. You'll get $15 to review KnownHost and I'll double that to $30 if you sign up through our link and review KnownHost after using them for a month. Start here! Save 15% for LIFE - Check out with a monthly VPS plan from VS2 through HY2 and use coupon code KH15LIFE to save 15% for life. To visit KnownHost, click here and choose the plan that's best for you. You'll be hard pressed to find much negativity about KnownHost in the VPS review world. The only reason they don't rank higher than the rest on MOST sites isn't because their service is lacking, rather, KnownHost is a company that would rather spread by word of mouth than be a company that pays top dollar for referrals from affiliates. In fact, if you sign up through this site and then submit a full review to my readers, I'll be paying you more than I earn (see commission type)! For me, this site is less about earning money and more about earning a reputation in the VPS community as a real VPS review site (I strive to the the best actually) with real sources, real facts, and real research, all done by someone who knows a thing or two about virtual private servers and has used them for well over 5 years. I chose KnownHost as the best hybrid VPS company on the market because they are one of few that offer VPS plans with this much power. The only step up from a hybrid VPS would be to go full dedicated servers which KnownHost also makes available. I've spent weeks scouring the web for reviews, questions, and other various concerns from their customer base to complete this in-depth review. * In the interest of fitting all this data, please note, KnownHost offers DirectAdmin, Plesk, and cPanel/WHM for $5 more a month on all plans. Update January 10th, 2013: I removed "Hybrid VPS" from this section as KnownHost has removed these services from their offering and added VPS-5 through VPS-7 to the list of packages. They have expanded the VPS packages and encourage Hybrid customers to switch to either VPS-6 or VPS-7 which includes 8x priority CPU when the server is at max capacity. I've since switched from HY-1 to VPS-6 and have noticed no problems with the switch. I even save $20 a month. VPS-1 (formerly VS1) saw a massive increase from 192MB RAM to 512MB RAM, 20GB space instead of 10GB, and 1,500GB bandwidth instead of 500GB. This package is now available to have cPanel installed and would be a great starting VPS. All other packages saw a RAM increase and most packages saw a slight increase on disk space as well. Update April 21st, 2013: KnownHost has updated the packages as of April 8th, 2013. I reflected these changes including lower pricing to VPS-4 and increased bandwidth to the VPS-6 package. KnownHost has done nothing worse than remarkable when it comes to customer support. Looking over my ticket history with them over 5 years, they have always responded within an hour or two and provided me with fantastic and friendly support. Typically, I'll have a response in 15minutes or less, which is fantastic. In fact, one of the main reasons I stay with KnownHost besides the reliability is the their willingness to go way above and beyond what I feel they should do when I submit tickets. In one example from January 26th, 2012, Rachel from KnownHost assisted me with troubleshooting an .htaccess problem my developer was having. It turned out to be the developer that had it wrong, but KnownHost went above and beyond looking at my site and determining the issue. In another instance, Megan was friendly and very helpful while helping me deal with a cPanel account that was compromised. Note to my viewers, don't send your login credentials to a developer over plain text whether it's email or IMs. If you must, send portions of your credentials over multiple channels. For software, KnownHost is currently using Kayako's SupportSuite to manage their customer support system. On April 10th, 2013, KnownHost updated their entire website look and they included the SupportSuite in the redesign. Prior to the update I complained about their outdated look on their ticket system, but now, I have absolutely no complaints! The most important part is how KnownHost handles their support tickets, and I'd have to rate them a well deserved A+ because I've never once had a complaint! Besides the ticketing system, KnownHost also offers toll free telephone sales and billing support, a knowledge base, and a community forum for their customers to use to discuss issues they are having. One of the things I like about their forum is they actively report network or server issues along with frequent updates as they work on and fix the issues. I've had a couple outage experiences with KnownHost and that forum told me what was wrong, what they are doing, and when it was fixed. 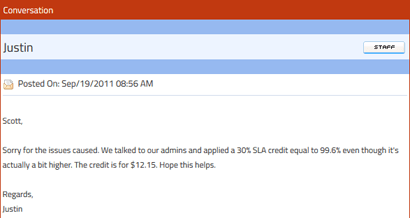 On September 19th, 2011, which was my last major outage, they gave me a 30% SLA (Service Level Agreement) credit. What should be improved: I'd like to see KnownHost add a live chat system for customers to get help and for them to include technical support agents on their telephone system for those emergency situations where help is needed immediately. The last thing I'd love to see is automatic credits for downtime. I don't feel it should be the customer's responsibility to monitor their Virtual Private Servers with uptime services like Pingdom to discover outage situations that require crediting. The KnownHost billing center is about as basic as it gets but gets the job done. I decided to include the screenshot from my account specifically to show you that I've been using them for quite some time now. In this screenshot, you'll notice I've received 102 monthly billing notices and paid over $6,080 to KnownHost through 5 years. At the time of this review, I've used KnownHost for 5 years and eight months! 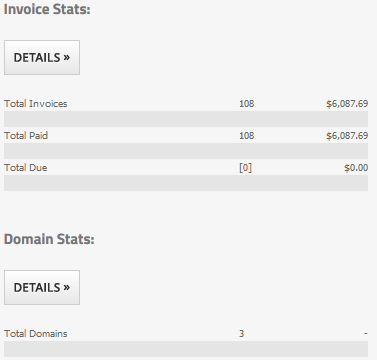 It is important to note that my screenshot shows 3 total domains. One is cancelled because I moved to a hybrid VPS plan (HY1 specifically) and the other was cancelled because I moved the VPS to an InMotion Hosting VPS, not because I was unsatisfied, but because I wanted to have this legitimate site. You are reading that correctly, this site, BestVPSReviews.com, caused me to move one VPS from KnownHost to InMotion Hosting just so I can provide you with my real experiences with both companies. Now that is dedication! FYI, this site is currently hosted with an InMotion Hosting VPS plan. Anyway, the billing center has a navigation bar on the top that allows you to view and update your personal information, view your packages and domains hosted, see invoices, change credit card, and contact customer support which I showed that information above in my customer support review. Here is where I hope to go above and way beyond what these other "review sites" show you. Below, I have included KnownHost reviews from countless trusted resources. By that, I mean, sites that have moderators that actually receive your review and then verify the authenticity of your information. Your review could be here and I'll pay you up to $30 for it! If you've used KnownHost, please help me out by being my first KnownHost reviewer? I know I'll appreciate it and my viewers would too! Learn more. Chris Nowak took us up on the above offer and sent us a full KnownHost review with his personal experience. He had some problems with the transfer of his 120+ websites to KnownHost but was able to get the all resolved through the help of KnownHost customer support. Chris said: "Where they did an outstanding job was with a custom PHP mass mailing script. It wasn’t working anymore, wasn’t showing my client’s old mailings, something was not right. Steve from the support team did an outstanding job as he went into the script itself and searched for the error and after trials and search he found the problem. It seemed the problem was inherent to the script and not the server configuration. I paid nothing for that, it was included in their service." Read the full KnownHost review. mAurelius from this WebHostingTalk thread said "The #1 thing that stands out is their service and support response time. Most the time when I submit a ticket, I'll get some sort of reply within 5-15 minutes, and I'm not even marking the tickets "critical." The other day I requested transfer of about 12 sites from another host's cPanel account, and within 45 minutes of submitting the ticket, they completed all the transfers for me." pabbe from this WebHostingTalk thread complained about KnownHost saying "My site keeps going down every few days, there are also times when the site takes ages to load. Even though I am using a VPS account for the first time - I know the performance cannot be worst than the shared hosting account i used. I can easily say my uptime was better when i was with HostMonster. Their customer care keep telling me that they have optimized my account and that there is no issue with my account." However, this was responded by KnownHost-Jonathan, a KnownHost staff member, that external resources loaded via plugins were causing slow load times. e3lanweb from WHT had this to say after using KnownHost for 4 months "The ticket response time is anywhere between 0 & 10 minutes ! all the time 24 hours 7 days a week. They have a very very good trained staff. They work fast on your issues and when they solve the problem, you will get a detailed explanation of all the changes made on the server which is very very useful for me." regex started a thread on WHT asking which VPS was best for speed comparing WiredTree, HostGator and KnownHost. This is one of my favorite reviews because he ended up ordering all three and tested it for himself then reported back with the results here and said KnownHost was the fastest according to his benchmarks. byezan of WHT said "I know six weeks is not long, but so far my experience has been good with a smooth migration (23 cPanel accounts), 100% uptime and the support I needed as a VPS newbie (9 support tickets) has been nothing short of helpful and polite. What has been very helpful is the support team always reply with the commands they used to perform a task I was struggling with." Bakie of WHT, who has used KnownHost for 17 months at the time of his review, said: "Performance wise this VPS has been the best one I have ever had. I host about 10 different websites on this server which the most popular being my Arcade website. It gets around 80,000 UV a month and about 400,000 page views so it’s a medium sized site which this VPS seems to have no problem running. I normally use between 300 and 400GB of bandwidth a month. All of the videos and games are hosted on the server and I have never had anyone complain about loading times." ShoutMeLoud owner Harsh Agrawal detailed his move from HostGator shared hosting to a KnownHost VPS. In this review, he had a lot of great things to say including "I would love to rate KnownHost as 5/5 for their excellent server optimization and resources and support." and "Over all, if your WordPress site is growing and you need to add more resources, a fully managed VPS is your best bet. If you are good with managing your own server, I would recommend Linode unmanaged VPS, which is cheaper. But, for a normal blogger with limited Technical skills, KnownHost server is a good pick." I recommend giving this page a read because he details some of the things he had to deal with moving a WordPress blog from shared hosting to a VPS and he also took advantage of the KnownHost site migration feature to move his WordPress blog with Thesis theme. I am honored to be hosted with a generous VPS company. Did you know that RFA, short for Restavec Freedom Alliance, has received a free VPS from KnownHost? RFA helps Restavec (children who live outside of their parent's homes in Haiti) children by offering safe, stable, and family-centered environment for this children. 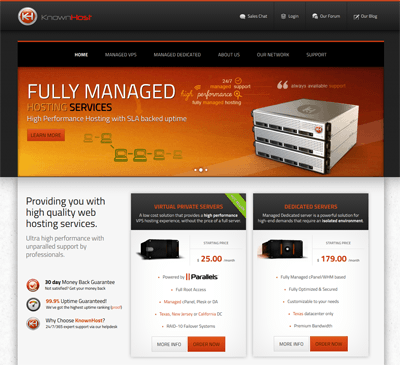 KnownHost has been offering this free VPS to RFA since July 10th, 2012. Awesome, right? Full root access from the day you sign up. Managed VPS hosting included free of charge. VIP program. If you are hosting for other websites or need more than 3 VPS plans, KnownHost further discounts you with up to 25% off. Extra IP addresses are only $1/month. Cheapest I've seen. Softaculous or Fantastico, an easy software installation system, are both only $1/month if needed. Choice of data center during your sign up. With KnownHost you can choose to host your VPS at Texas, New Jersey, and California. Typically, you'll base this decision on where you live so that the site is fastest for you (especially if the site is for and visited mostly by your surrounding area). The Texas data center (Colo4dallas) is where KnownHost started and is where their technology and support is centered around. KnownHost Quality - Boy, Are They Dependable or What? KnownHost is known for their quality, pun intended. One of the reasons I started my first VPS with KnownHost was based on all the positive reviews and their own site's information on the servers and networks they use. Many hosts sort of hide behind the fact they use leased servers at leased data centers, whereas, KnownHost owns and manages their own equipment. Multiple data centers - Again, you have a choice between Texas, New Jersey, and California. Head over to KnownHost and click "Our Networks" at the top. From there, you'll have access to all of the technical information of each data center as well as a test file to download. You can also do a tracert to their IP to see which one is fastest and closest to you (least hops). Amazing proven uptime - Hyperspin has been testing KnownHost and has shown a 99.980% uptime on over 232 servers. Amazing! RocketVPS is also a KnownHost company and they have the #1 ranking with 15 servers monitored with a 99.999% uptime. About the Hyperspin results, most companies only let Hyperspin test a select few VPS plans they keep online with the highest priority whereas KnownHost lets them test hundreds. That says something! 99.9% network uptime guarantee - Be sure to check out the SLA link at the bottom of the KnownHost site on how they credit you if your VPS ever goes offline. I have claimed this twice without any hassle. Just create a ticket and document the downtime (I linked to their forum showing my VPS was down). 30 Day Money Back Guarantee - All packages excluding dedicated servers come with a 30 day no hassle money back guarantee. Since you are typically going to sign up with a monthly payment, you also won't be locked in and "stuck." I don't know if you remember, but earlier, do you remember when I said I expected KnownHost to increase disk space and memory around Christmas? Here in this section, you'll see exactly why I think this will happen with almost 100% certainty. April 10th, 2013 - KnownHost completely revamps their website layout. This page was updated with new screenshots as a result. July 10th, 2012 - KnownHost announces donated VPS hosting service to RFA (I mentioned this earlier). December 25th, 2011- KnownHost Santa increases bandwidth and RAM for every Managed VPS and Hybrid server. December 12th, 2011 - KnownHost expands its VPS offering by adding a New Jersey data center. February 22, 2011 - KnownHost announced they built their 11,111th VPS. December 25th, 2010 - KnownHost Santa increases disk space, RAM, and bandwidth for all VPS and hybrid plans. KnownHost is where I started my first VPS from and if you are choosing to go the VPS route, it won't be a mistake to choose them. This review took quite the long time to write up and if I've helped you with your decision, I'd be honored if you ordered through this site as a reward for my efforts. I hope I've covered everything you were wondering about KnownHost. If there is anything I'm missing or you want more information on, simply send me a quick email and I'll get this review updated ASAP. For your information, I am currently using the Hybrid VPS HY1 plan and love it to death. Specifically, my VPS is the HY1-TX VPS which signifies that it is being hosted out of the Colo4Dallas Texas data center. I have had this hybrid VPS since March 5th, 2011. Before that upgrade, I had the VPS2-CA from August 5th, 2007 - October 5th, 2012 (moved to InMotion Hosting as I mentioned earlier), and I had the VP2-TX plan from December 29th, 2007 - November 29th, 2010. This was the server I eventually migrated to Hybrid plan at KnownHost after a short 3-month stint of VPS hosting at WiredTree. I give permission to KnownHost staff to verify this date information with anyone who asks (but nothing more). Updated on October 25th, 2013. Added a KnownHost review received that claimed my $15 offer. If you are willing to write 1,000+ words about your KnownHost experience including screenshots, names of customer support agents you've worked with, and willing to provide at least one website that I can use to independantly verify you are hosted with KnownHost, click here to begin the process.